Barkisland V Elland. Alax Scholefield. Alex Scholefield and Jake Finch were the heroes as Barkisland snatched an unlikely two-run win at second-placed Shepley in the Huddersfield League. The visitors could only muster 85 with Jamil Nasir (seven for 14) ripping through their ranks. However, Darren Robinson’s side produced a stunning comeback on what was clearly a bowler-friendly wicket with Scholefield (five for 37) and Finch (four for 24) dismissing Shepley for 83. Also in the top flight, Elland lost by 60 runs at home to bottom club Shelley. Third-wicket pairs dominated the scoring, opener Abdul Wahid (88) and Benjamin Cant (55) helping the visitors to 241 for eight. The Hullen Edge men had a chance while Robin Broom (75) and Jacob Bower (49) were at the crease but Elland finished on 181 for nine. Lightcliffe will need to brush up their batting to avoid a Priestley Cup upset at home to Batley today. Skipper Alex Stead was let down badly as the Wakefield Road men lost by seven runs at home to lowly East Bierley in the Bradford League’s top flight yesterday. Visiting openers Neil Gill (30) and James Ford (27) put on 49 for the first wicket before both were bowled by Sam Gardner and the visitors slid from 106 for three to 151 all out. However, that proved enough as Stead looked on in dismay as a succession of partners departed to spinner Luke Jarvis (five for 36) and opening bowler Tuseif Arshad (three for 26). When Stead was ninth out for 70 with the total on 136, the visitors grabbed their chance. Rob Burton’s 13 was the next-best score for the home side. After having to wait until the previous week for their opening Championship B win of the season, Brighouse made it back to back successes. They beat Hartshead Moor by wicket wickets in the battle of the bottom two. After a delayed start, Moor laboured to 111 for nine in 40 overs with Aleem Ladak (three for 21) showing the way for the Russell Way men. Brighouse were making fairly hard work of it at 85 for five but opener Raja Najeeb was still there and his unbeaten 50 completed the task and moved his next-to-bottom side closer to the pack. Northowram Fields moved about inactive title favourites Buttershaw St Paul’s into second place in the Conference with a routine 65-run win at bottom team East Leeds. Robert Smith (46) and Chris Metcalf (39) led them to a total of 187. Prolific wicket-taker Zafar Khan (five for 29) had another good day and was well supported by Jonathan Lee (three for 17) as the hosts were dismissed for 122, having been 15 for three and 67 for seven. 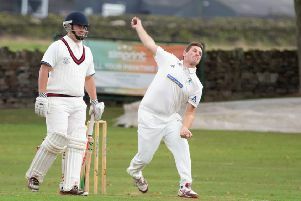 Illingworth suffered a seven-wicket defeat at the hands of Aire/Wharfe Division Two leaders Guiseley. Asked to bat on a damp wicket, visitors Illingworth got off to a good start with James Lawton moving back to the top of the order and hitting 38. His exit caused a mini collapse as Illingworth slipped from 69 for one to 78 for four. This became 112 for six, but the returning Veryan Brooksby scored quickly with some big sixes into the football ground to take the score to a competitive 159. In reply, Illingworth got off to a great start with Ben Robertshaw and Ben Clarke each removing an opener to leave the table toppers in trouble at 26 for two. However, Michael Truswell hit a fluent 71 as he took his run tally for the season to 478 runs, and Guiseley eased home with 15 overs to spare. Walsden beat struggling Middleton twice at Scott Street in the space of 24 hours in Pennine League fixtures. Umesh Karunaratne hit 78 in Friday’s 34-run T20 win and the Sri Lankan took six for 27 in yesterday’s three-wicket league success for the leaders. Middleton only made 118 but Walsden also found it hard going and were grateful to ex-minor counties player and Cricket Asylum coach Matt Dawson, who followed up his four victims behind the stumps with 24 not out.